THE DISTILLATION of the genres that the five members of Dapp Theory inhabit and are influenced by produces a new album of quite dazzling musicianship. 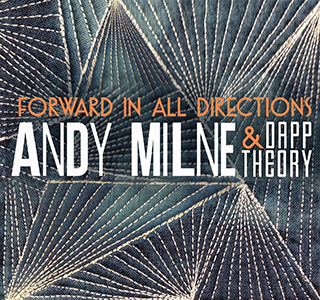 Directed by pianist and keyboardist Andy Milne, Forward In All Directions primarily exudes jazz, rock, funk and hip-hop, with a dash of vocal poetry – yet this resulting programme of Milne’s ten originals borders on the uncategorizable, such is the breadth of its creativity and eclecticism. Firmly established on the New York jazz scene and respected highly as both musician and educator, Canadian-born Andy Milne’s CV speaks for itself, including associations with Steve Coleman, Joe Lovano, Archie Shepp and Ravi Coltrane. Dapp Theory has been in existence for some fifteen years and was formed, in Milne’s words, to “tell passionate stories, promote peace and inspire collective responsibility towards uplifting the human spiritual condition.” He sees this latest release – co-produced by renowned Yellowjackets founder Jimmy Haslip – as a milestone; and that sense of celebration is communicated by a personnel equally adept with angulous strength and dreamy lyricism: Aaron Kruziki (reeds and programming), John Moon (vocal poetry), Christopher Tordini (basses) and Kenny Grohowski (drums and percussion). Guesting are Ben Monder (guitar), Jean Baylor (lead vocal) and Gretchen Parlato (additional vocals). From the percussive complexity and pressing, synthy urgency of opener Hopscotch to the Return To Forever-like wordless vocal balm of Katharsis, there is much to discover here. Indeed, the profusion of the writing, instrumentation and improvisation within this sixty-five minutes is spectacularly whelming on a first hearing – and then different spotlights illuminate the detail over time in an abundant journey of discovery. Photographs illustrates this, its wonderfully crisp, buoyant rhythm supporting a shared, bright lead from Milne’s synth and Aaron Kruziki’s soprano; and Kenny Grohowski’s jazz/rock drumming technique (so well produced) is compelling throughout. A chilling, menacing theme in Search Party is maintained brilliantly by Fender Rhodes, synths and electric bass with sustained, inquiring lines from Ben Monder’s guitar; here, the anxious, megaphone-style vocal poetry of John Moon is well suited. The combination of Christopher Tordini’s earthy, tensile double bass and Kruziki’s douduk sets up the mysterious Eastern-imbued landscape of In The Mirror, Darkly. Then, conjuring a late ’70s sound world (echoes of Wayne Shorter, Jeff Berlin, Billy Cobham and National Health’s Dave Stewart), Nice To Meet You hits a kind of balanced retro funkiness, Milne’s colourful, chordal acoustic piano chords a key element of this stand-out track. The Trust‘s bass clarinet and sinewy piano sinisterly waltz and intertwine to Tordini’s supple double bass, Milne revelling in the open space; and the grittiness of his Rhodes in How And When Versus What encourages a terrific groove which gives way to serene, guitar-led transcendence (there’s so much in this!). Dreamy sax-led interlude Fourteen Fingers precedes a final, nine-minute spectacle of ‘prog’ proportions – Headache In Residence – thanks to its slow-burning, overdriven guitar energy. And, as with this entire project, it’s the sum of its parts which defines its ingenuity, Andy Milne and his colleagues evidently putting their heart and soul into it. In all directions… it’s quite a blast! Released on 8 September 2014, further information, audio clips, purchasing and promo video can be found at Whirlwind Recordings. THAT MOMENT when the ears prick up and the spine tingles. 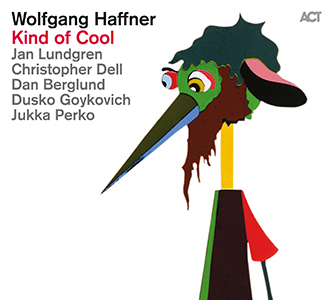 In the world of contemporary jazz, it happens fairly frequently… but not so often to this level. 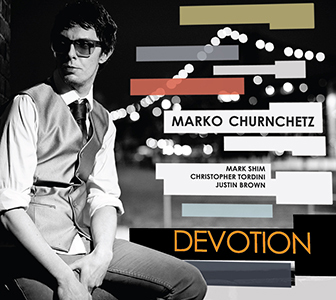 Debuting on the Whirlwind label, Slovenian pianist/keyboardist and composer Marco Churnchetz may just have entered the annual ‘best of’ stakes with Devotion – an outstanding programme of originals. New York-based Churnchetz (Črnčec) is clearly influenced by the 1970s explosion of seminal keyboard creatives, including Joe Zawinul, Chick Corea and Herbie Hancock. Together with an exceptional Stateside quartet – Mark Shim (tenor sax, midi controller), Christopher Tordini (basses) and Justin Brown (drums) – he melds stylish post-bop jazz and progressive jazz/rock grooves into an intoxicatingly distinctive fusion. And all presided over by his own staggering pianistic proficiency. Being There is a suitably sizzling curtain-raiser, the quartet’s acoustic personae bristling with energy, Churnchetz and tenorist Mark Shim quite breathtaking in their relentless extemporisations. Here is a band high in confidence, in full control – yet this is only for starters! The rapid piano and Patrick Moraz-like midi synth runs of feverish, flamencan Schizo prepare the way for the most incredibly gritty tenor show from Shim… and it’s the pin-sharp rhythmic edge provided by double bassist Tordini and drummer Brown which perpetuates the tingling excitement. Title track Devotion cymbal-shimmers to the lyrical meanderings of piano and tenor – a beautifully open and considered ballad which demonstrates this quartet’s shared intuition, building in intensity with Shim reaching his higher register. The jazz fusion pizazz of Gonzalost (presumably a reference to the brilliance of Afro-Cuban pianist Gonzalo Rubalcaba) is one of the finest recorded displays I have experienced all year. The perfect electric bass and Fender Rhodes groove partnership here summons memories of Bill Bruford’s late ’70s solo releases (Dave Stewart, Jeff Berlin), Shim carrying the pitch-bent synth torch brightly, and Justin Brown (fix the ‘drum cam’ on him!) absolutely scintillating at the kit. Complete with infectious Latin piano octaves and tremendous band co-ordination throughout, this is one for iPod repeat mode. A brief Interprelude keeps the pot boiling, leading to similarly blazing (and appropriately titled) Risk Free, characterised by highly-charged tenor and piano, and inhabitating a sound world which nods to the likes of Weather Report and the Moutin Reunion Quartet. Running at eight minutes (and in common with most of the tracks), there is space for themes and ideas to develop, Shim’s searching tenor displaying Shorteresque beauty, and Justin Brown magnificent in hard-hitting complexity. Shim’s mellifluous tenor lead in Without Tomorrow is achingly beautiful against supporting acoustic piano, bass and drums – an exquisite repose before the keyboard-fest of Late sparkles to the retro-imbued mix of Rhodes, midi controller, electric bass and drums (sans sax) – utterly irresistible. The closing Improvisation finds Churnchetz’s solo piano animated, rippling and enquiring – a raw glimpse of his unfettered creative genius. Released on 7 July 2014, further information and purchasing can be found here. A wondrous release – not to be missed!